When I was growing up we didn’t really have homemade cakes, my Mum was either training to be a nurse or in bed because she was on nights. I spent most of my time with my Nan and Grandad. Nan taught me to hang wall paper and Grandad taught me to ride but neither of them were particularly good cooks. In fact we only really had cakes for special occasions, Christmas Birthdays,Easter etc. They tended to be of the Mr Kipling variety, usually Fondant Fancies (to this day I can;t stand them) or individual Bakewell tarts. It was my dislike of these cardboard affairs and my sweet tooth that has resulted in my bookshelves overflowing with cookery and baking books; Nigella Lawson (my culinary hero) and Rachel Allen being among the most prominent authors. I read cook books like other people read magazines. There is usually at least one cookbook on the coffee table for me to flick through in the evenings. One of the things I have noticed, however, is that no matter how original or authentic an author claims their recipe to be, there is always someone else who claims that theirs is “THE” original one! Case in point is Bakewell Tart. It is from a little Derbyshire village called, surprisingly enough, Bakewell. I have seen recipes that have a pastry case, others have no case. Some call it Bakewell Tart, others Bakewell Pudding. To be honest, when I think Bakewell I think; pastry case with a layer of jam, an almond flavoured sponge and a white glace icing. It might not be authentic and I apologise to any native Bakewell dwellers that this recipe may offend but this is my version of Bakewell Tart. Preheat the oven to 160 C fan / 180 C. Grease and line an 8 inch square cake tin. Put all the base ingredients into a mixing bowl and beat until you have a smooth, soft dough. Tip the dough into the tin and press with your finger tips to spread the dough evenly over the base. Spread thin layer of jam over the base. Place all the remaining ingredients except the icing sugar into a mixing bowl and mix until an even consistency. Pour into the tin and spread over evenly. Bake for 25-30 minutes until the sponge is golden brown. Leave in the tin to cool. Meanwhile mix the icing sugar with a little water to form a stiff paste. Spread the icing over the sponge. Decorate to suit your taste. Previous PostLuscious Lemon Damp CakeNext PostIced buns or is it Nice bums? Not if you are from Bakewell apparently! But thank you! I tend to think of the Bakewell tart and Bakewell pudding as two completely different desserts just with similar names. Your recipe sounds good for a Bakewell tart, whereas a Bakewell pudding is in reality quite different (as you can sort of tell from the picture of a half eaten slice in my blog post which you have linked to). 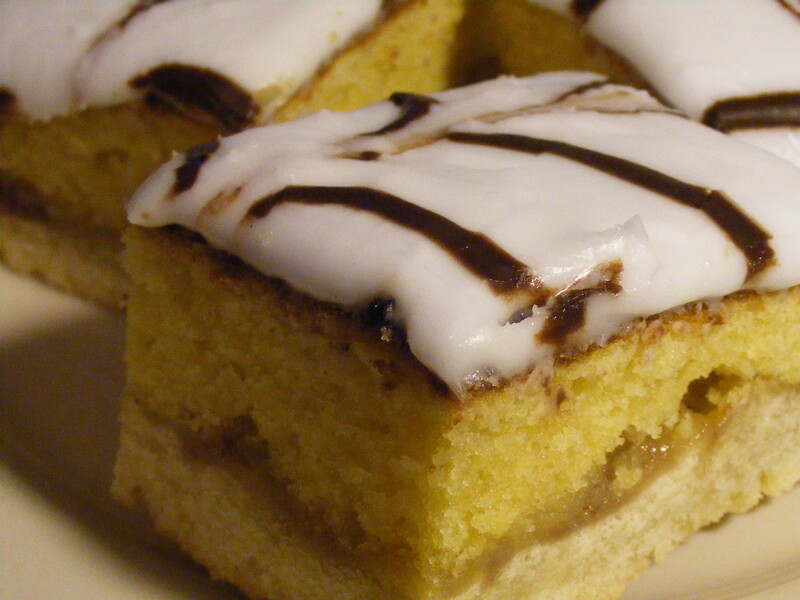 Anyway, whatever its name, the cake you describe making sounds tasty!